Looking for some serious power? 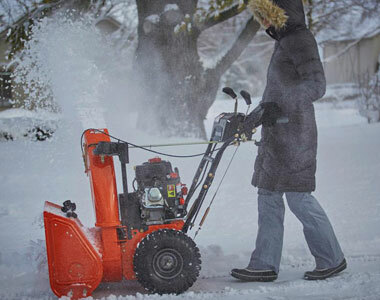 Check out the Ariens Compact 24+ Two Stage Snow Blower. This Ariens Compact 24+ is the new beefier version of the Ariens Compact 24. What makes it more powerful? The new Ariens AX engine gives you more power to achieve maximum performance and optimum quality. Also, the Ariens Compact 24+ comes equipped with 15" tires to help you plow through the snow with ease. Plus, with this blower you can eliminate the need for fussing with a pull start in the cold with the 120V electric start, just plug in and start blowing snow. You can choose from 6 forward speeds and 2 reverse speeds to get your job done quickly and minimize your time in the cold. 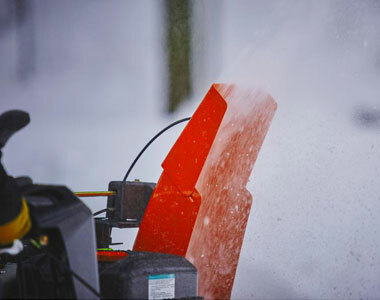 Engine: This snow blower features Ariens new AX engine model offering 208cc of power. These engines are built with optimal quality and the best torque maximum performance. Clearing Width: A 24 inch clearing width reduces time out in the wintry elements. Starting System: 120V Electric start with recoil. No more pulling! Chute System: With a 205 degree chute turning radius and manual deflector, control the throw direction with ease. Headlights: Equipped with an in-dash halogen headlight to see exactly where you are going. Tire Size: Power through the toughest elements with the 15" X 5" tires to keep you plowing all winter long. Starts easily and does the job. I like it. Excellent shipping. Great power and easy to use. Good value for the $. Used machine once without issue. Easy assembly. Quality product, American made. Got it the day before the "big" snow and it worked like a champ! My snowblower was damaged in shipment in an area not visible until it was assembled. Communication with Jacks was difficult, and I was not kept in the loop by my representative regarding availability and arrival of replacement of parts. Eventually I received replacement parts at no cost, which I appreciated, but it was a struggle and at times I wondered if I would receive them at all. They need to work on their customer service /communication skills. Well, it arrived safe and sound in its shipping crate. Securely packaged, with all parts present and no visible damage whatsoever. Some assembly was required, which took very little effort and was completed with great ease. Added some fuel and fired it up. The machine started on the first pull (after priming), and the motor seems quite sound. Of course it was only August, so with the absence of snow, there was no way to see how well it functions. Once we get some snowfall, I'll be happy to report back. Overall, the experience thus far has been flawless. Thanks very much. From the easy order to shipment 3 days later everything went smoothly. Assembly was about 20minutes with no swearing. Fired right up first time. Had Ariens for years. Great equipment. Shipping was fast. Had to make one small adjustment on Forward/reverse shifter. All is good. Thanks. 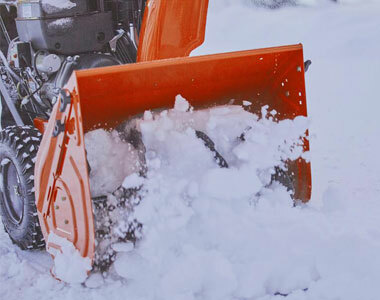 Ask us about the Ariens ST24LE Compact+ 24 inch 208cc Two Stage Snow Blower . Please no repair questions. Your Q&A may be posted to SnowblowersAtJacks.com to help other shoppers, like you, with their purchasing decisions. Thank you. Can you use it on a gravel driveway? Ralph, yes you can use the Ariens Compact 24 on gravel. I'd recommend raising the skid shoes to their highest point to lift the auger housing off the ground, so you won't scrape up gravel. And remember, to direct the discharge chute away from cars, houses, and other objects that may be damaged by a flying stone. Is this model self propelled like the 24' Deluxe model? Rich, yes this snowblower is self-propelled with a disc-o-matic drive system. Mary Ann, The electric start means you can plug in an extension cord to a power outlet to start the engine. Once the engine is started, you can disconnect the cord and operate the snowblower. The electric start is an alternative method to the typical recoil/pull start method. It is still a gas-powered engine. Can I move the handle bars? Jose, the handle bars on the Ariens 920021 can fold down for storage, but they cannot be adjusted for different heights. Asked on 1/28/2016 3:29:57 PM by R D.
Where are you located and how much does the Ariens 24 inch compact snow blower model 920021 weigh? Our local retail store is located in Jarrettsville, MD - View Directions. The Ariens 920021 weighs 178 lbs. Does both wheels turn or just the one? You can lock just one wheel at a time, or you can place the lock pin through the inner axle and that will allow both wheels to turn for better traction. 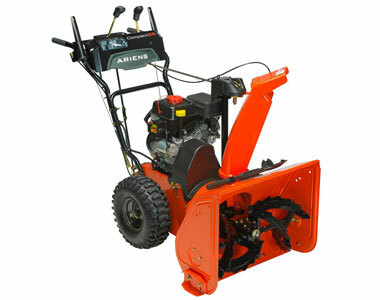 Dan, the Ariens Compact 24" snow blower is powered by a 4-stroke Ariens AX engine manufactured by LCT. No need to mix gas and oil. Bill, the Ariens Compact 24 also comes with a headlight and a 3 year warranty, instead of the 2 year warranty on the Sno-Tek 24. You'll get an extra year of warranty protection in case your unit has an issue. As you mentioned, the gear box material (cast iron) on the Compact 24 is built to be longer-lasting than the aluminum gear case on the Sno-Tek 24. A more durable gear case will stand up to tougher conditions, lowering the risk of damage and service. Currently, we are only selling the Ariens Sno-Tek 24 in store (local delivery only) instead of shipping to locations in the lower 48 states.